Thank you for your interest in Brannen & Loftus, PLLC. We want you to know that sending information to us by e-mail and/or through the internet does not create an attorney-client relationship. Formation of an attorney-client relationship—and a duty on our part to keep information confidential—can occur only after we check for any possible conflicts of interest and we reach an agreement with you on the scope and terms of the representation. Until such time, you should limit your communication to the minimum information necessary to allow us to contact you. If you don't become a client, Brannen & Loftus will not be precluded from representing another client adverse to you in the future, even if you send us material you consider confidential and sensitive and even in a matter where the information you transmit to the firm could be used against you. By clicking 'EMAIL' you understand and agree to these terms. Justin is an associate at Brannen & Loftus. Justin graduated from Amherst College with a degree in Classics and received his law degree from UC Berkeley School of Law, where he was Production Editor and Book Reviews Editor for the Berkeley Journal of Gender, Law, and Justice. While at Berkeley, he spent three semesters assisting victims of domestic violence at Bay Area Legal Aid in San Francisco. Prior to joining Brannen & Loftus, Justin worked as a law clerk for the Vermont Superior Court in Windsor and Orange Counties for two years. 2014 UC Berkeley School of Law, J.D. 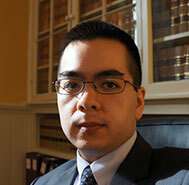 Admitted to practice in Vermont, Massachusetts, and New Hampshire (pending, awaiting results of 2016 NH Bar Exam).